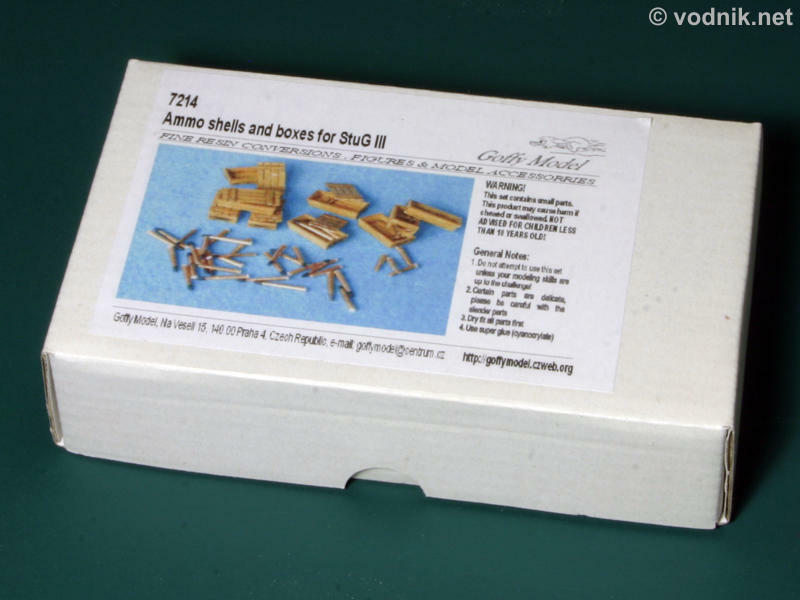 Reviewed set from Goffy Models contains resin parts for 10 wooden ammunition crates with separate lids and 35 shells (incl. 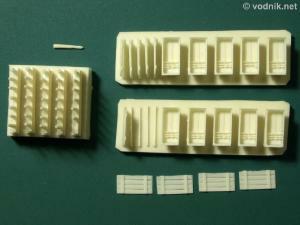 five empty ones) for StuG III model in 1/72 scale. StuG III used 75 mm gun and the ammunition from the set can probably (I don't know much about WW2 armor) be also used with other models of German WW2 vehicles equipped with similar weapons (e.g. Panzer IV). Goffy set comes in a small cardboard box with a printed photo of painted contents of the set on the lid. Inside the box is a single zip-bag with all resin parts inside. There is no filler in the box, which could protect parts, so some of them separated from resin pouring blocks in my set. These included one shell and four crate lids. Luckily they all separated cleanly without damaging parts. Wooden crates and lids are very nicely molded and feature realistically looking (although probably much over scale) wood texture and details of shell support frames inside. Lids are extremely thin - probably very close to correct scale thickness. Unfortunately ammo shells look much worse then crates. 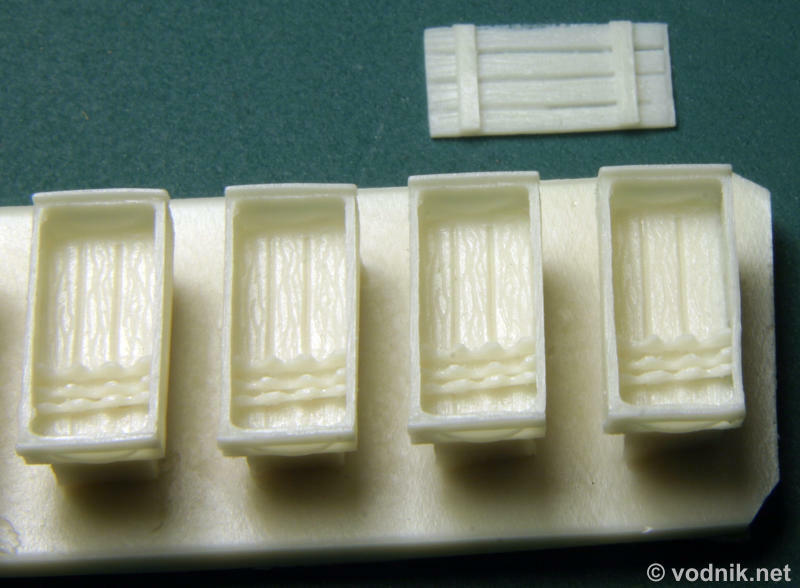 Some shells are not quite straight, all have uneven surface and some tips are not fully molded, which means that some shells end with sharp tips, while other have flat or rounded tips. All five included empty spent shells have chipped edges. Click on picture to enlarge it. Close-up of full and empty shells. Note uneven surface of shells and chipped rims of empty shells. Nice details and wood texture inside ammo crates. 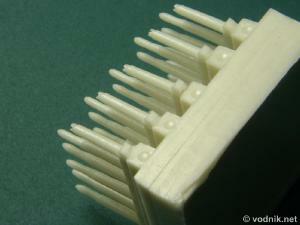 There are no air bubbles and no flash on parts. Ammo shells and crate lids can be very easily separated from resin pouring blocks, but it can cause more problems in case of crates, as the area of contact of crate bottom with the pouring block is relatively big compared to the size of the part itself, particularly that the bottom of the crate should be sanded very thin. Goffy set is a mixed bag. Well sculpted and molded crates are accompanied by mediocre shells. 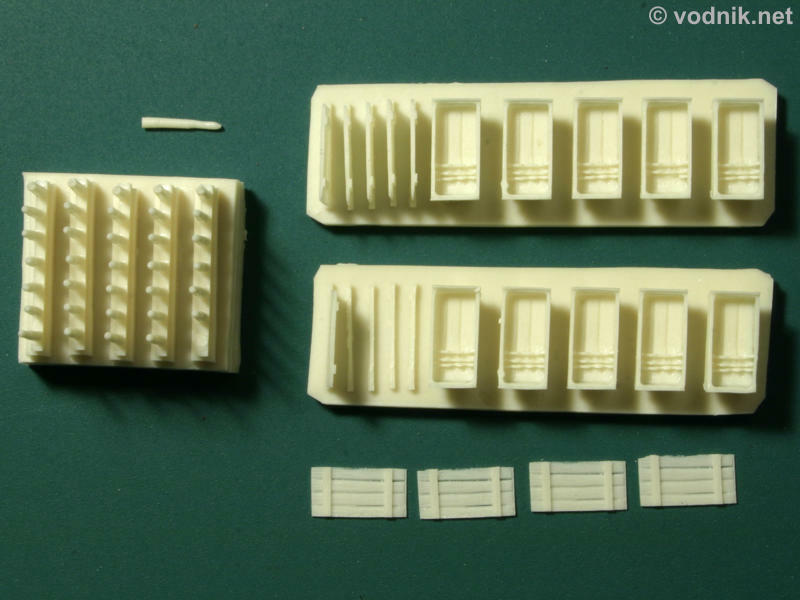 They might look acceptably once painted, but lets be honest - painted pieces of styrene rod would also look acceptably at this scale. And it really shouldn't be that difficult to create and mold much better shells. Judging from the quality of other Goffy Model products, they definitely have the tools needed to do this, so it is a shame they didn't use them properly.